While Creed II continues boxer Adonis Creed’s fight to establish his own identity, the sequel ironically falls victim to the very lesson he has to learn: the only way to live up to a legacy is to create your own. Sadly, Creed II just doesn’t do that. Ryan Coogler’s stylish, intense 2015 original worked so well because it told us an old story in a new way, always knowing when to go a little over the top and when to underplay things. That understanding is where Creed II director Steven Caple Jr’s seeming attempt to recreate the same tone misses the mark so glaringly. Creed II tries so hard to live up to its predecessor that it doesn’t end up having much of its own identity. Had Caple abstained from the Rocky formula a little more and made this movie his own, we could have had a much more interesting story, instead of a rehash of a film that already skewed close to the 1976 classic. Creed II picks up with Adonis (Michael B Jordan) on top of the boxing world and indulging in some of the same pomp and circumstance that his father was known for, entering the film’s first fight with overblown drama of Pretty Ricky Conlan’s arrival in the final fight of Creed. When one of the first things you see your hero do immediately evokes the villain of the previous film, the writing’s on the wall for what that character’s arc is going to be. Much of the film’s drama feels preordained and subsequently isn’t very exciting, which is especially disappointing considering who’s in the other corner of the ring. 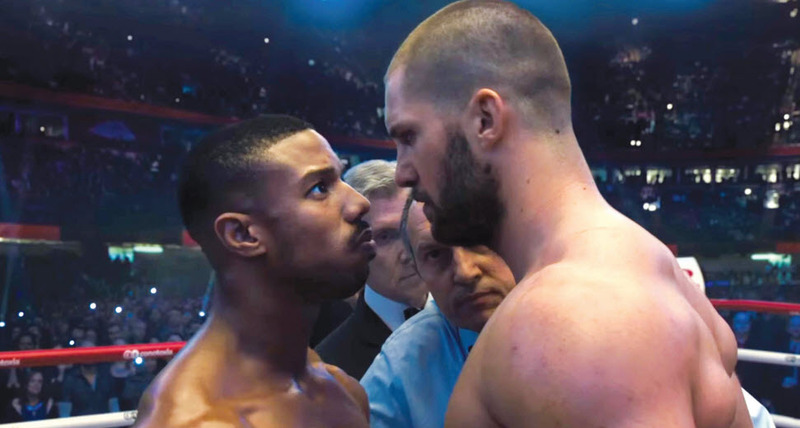 For as much as the previous film makes of the struggle to get out of the shadow of the past, Creed II features some distracting call-backs to the franchise’s history. Hearing Ivan Drago (Dolph Lundgren) bring back his iconic “break him” line once would’ve been great … but you’re going to hear it a lot more than once. Creed II made a big gamble by featuring Viktor Drago and his father Ivan as the antagonists. As the film constantly reminds us, Ivan Drago killed Apollo Creed in the ring just before Adonis was born. Ivan’s subsequent loss to the avenging Rocky shattered him and saw his family run out of Russia in disgrace. So Viktor’s story parallels Adonis’; he’s a man whose turbulent upbringing was defined by the outcome of that fateful fight. There was opportunity there to make Viktor a compelling foil to Adonis, but the film doesn’t let us get to know Viktor or what he wants, so he really isn’t that interesting. While the Dragos disappoint as villains, the central trio of Adonis, Rocky, and Bianca are still easy to invest in and carry Creed II through its shakier parts. The struggles these three characters have to overcome outside of the ring are far more interesting than any of the fights inside it. Jordan’s Adonis proves to be far more vulnerable as his battle this time is less against the ghost of his father and more against himself and his continued desire to create his own legacy. Sylvester Stallone continues to be a surprisingly moving father figure to Adonis here. He has less to do with the boxing action this time around, but he excels at humbling Adonis and imploring him to remember what he’s fighting for. Stallone’s pained conflict about whether to support Adonis in his fight against the Dragos is understandable, given how guilty he still feels about what happened to Apollo. The Italian Stallion ends up getting the biggest laughs and the most stirring moments of the film. Tessa Thompson continues to shine as Bianca, keeping Adonis’ growing ego in check while exhibiting perhaps as much bravery as her partner while fighting her own battles. Adonis’ relationships with Rocky and Bianca keep the film grounded and, in a lot of ways, are the only thing keeping Creed II on the rails. We want Adonis to win largely because it would hurt too much to see the pain he’s put Rocky and Bianca through be for nothing. You’ll notice that for a movie that centres around boxing, I’ve barely mentioned it here. That’s because the fights in this movie are deeply forgettable – not just because Creed’s opponent is a bland and vague character, but because the straightforward cinematography of these scenes just doesn’t have any of the vivacity of the fights from the previous film. Ultimately, just like Adonis himself, director Ryan Coogler proved with Creed that this new iteration of the Rocky franchise could stand on its own and forge its own legacy. Creed II, however, can’t seem to let the past go, abandoning the exciting new path blazed by Coogler in favour of evoking what’s come before, with undeniably diminished results.